Can a Lender Declare a Nonpayment Default Because of “Political Risk”? Earlier this year, the federal 7th Circuit Court of Appeals issued a major ruling against lenders. Although the case involved federal bankruptcy law, there is plenty for victims of bad banking behavior to celebrate. To put the case in context, some history is necessary. 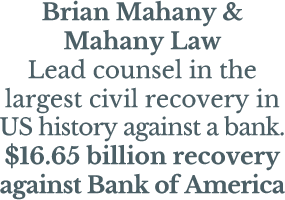 We love it when a jury hits a major financial giant punitive damages. It doesn’t happen often but that is because most banks and lenders would rather settle before going before a jury. Keeping the case alive long enough to get them to the jury is the trick. We are publishing this piece as general information. The laws in every state are different, especially when it comes to residential foreclosures. We urge you to contact a local lawyer for help. Knowing that finding someone good is often a challenge, especially when funds are tight, we offer some specific suggestions below. Before we get to the specific guerrilla tactics, there are some general things you should consider. Much of this is what you typically find on the Internet.